As part of a road trip through the southern states I visited La Grange, Georgia. In 2017 it attracted press attention as the first town to officially apologize for the circumstances that led to the lynching of a young African American man, Austin Callaway in 1940. 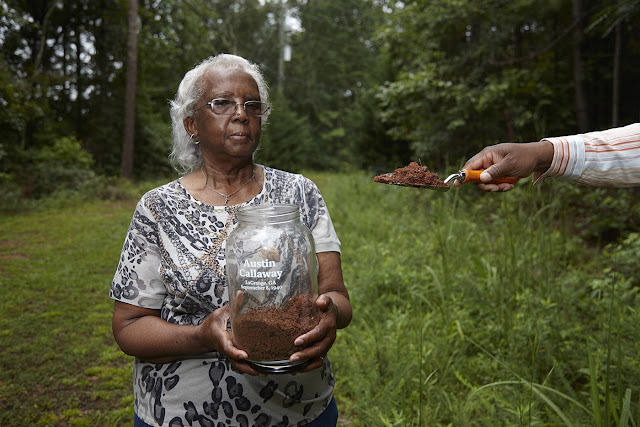 As part of the Equal Justice Initiative's 'Community Remembrance Project', soil from the sites of known lynchings was collected in special labelled memorial jars to be installed at the National Memorial for Peace and Justice. 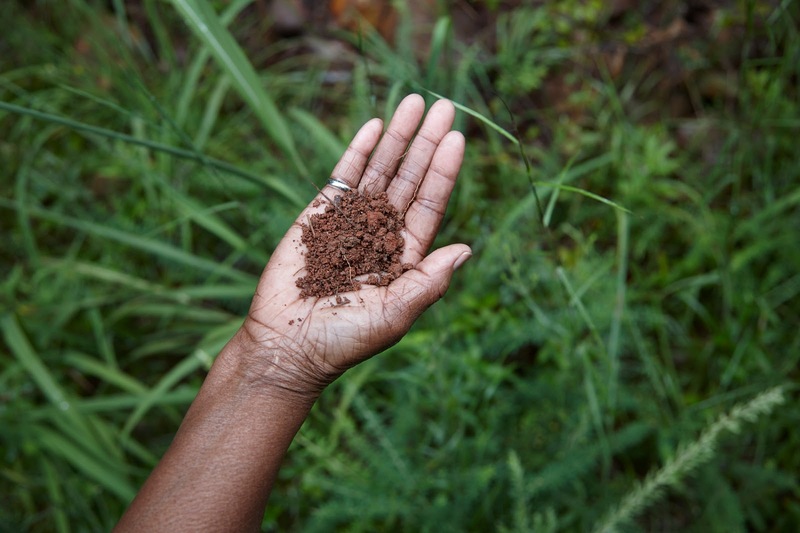 The soil collection for Austin Callaway's memorial jar had not yet taken place and before leaving for the states I requested that any descendants might be found and asked if they would participate in the collection as a specific event for the camera. 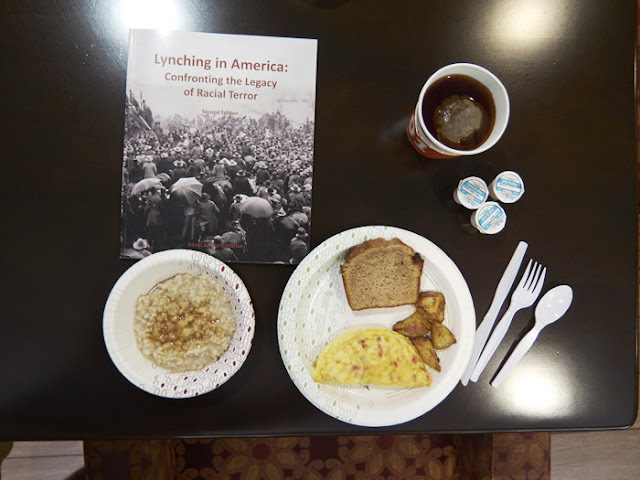 Arriving from the UK, racial politics feels very different in the US, in many ways more progress has been made and even the unresolved issues between black and white feel closer to the surface. In Britain we are culturally less used to airing racial division so openly. We arguably avoided a US style civil war by massively compensating slave owners, funding the industrial revolution and we have unsuccessfully circumvented the conversation ever since. But even in the US there is a reticence to fully negotiate the minefield of racial tension and the EJI project recognises that contemporary generations are shaped by an emotional legacy associated with victim, perpetrator or bystander. The genius of the Community Remembrance Project recognises how these old wounds perpetuate continued prejudice and division, damaging everyone. When I visited the EJI offices in Montgomery, Alabama, the home of the civil rights movement, I was conscious of the monetary value of 'civil rights tourism' and in light of William. C. Anderson's article 'When a lynching memorial becomes a photo oppertunity' I can empathise with how behaviours more associated with tourism than commemoration are perceived as disrespectful. I photographed myself at the Rosa Parks bus stop, was photographed with the minister of Martin Luther King Jr's church and was even offered a haircut by his barber; At a time when tensions were rising in nearby Charlottesville, I sent a postcard of black prisoners to my partner in the UK with the standard sentiment and ironic 'Wish You Were Here'. 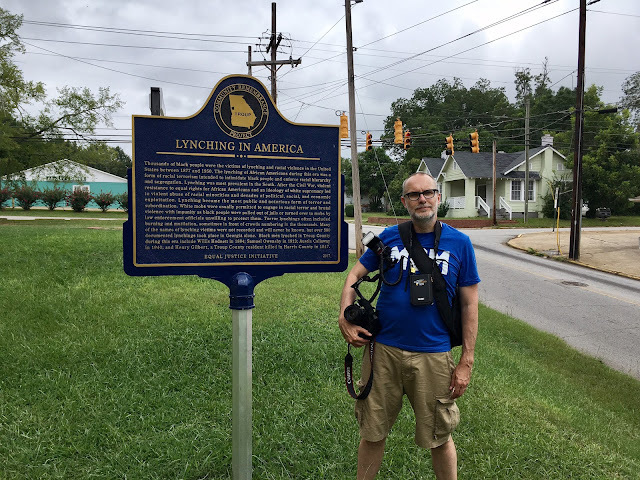 There are many people on holiday visiting the sites on the civil rights trail offering opportunities for the virtue signalling selfie as valuable currency for our social media feeds. I can see that a form of 'Disneyfication' of the black struggle has occurred in making the suffering more palatable to the white visitor so as not to alienate and in that there is a danger of an empathic disconnect from the very demographic trying to be reached in any re-education process. However the overall approach across all the sites is an attempt to be educational, there was a generous welcome at MLK's church and I felt I was a valued guest in someone else's history and the minister pulled no punches in reminding our group tour that the oppression and inaction against black people was by 'white folks'. Surrounded by the safe space created by the love and forgiveness of the pastor there was a palpable sense of shame I faced in that moment at odds with an otherwise glorious narrative of British colonialism and white history that had an early influence on my racial and cultural identity. A confidence built on these foundations is racist. There is an art to remembrance; in the UK we have our ostensibly conservative and austere permanent memorials to heroic sacrifice in 'victory' but we have no significant monuments to any collective guilt or moral failure defining our past as less than glorious. Germany, crushed and defeated twice and re-born, has embraced another form of national commemoration and Berlin especially has monumentalised the lessons of humanity born from defeat and hubris (my favourite is the Room of Silence at the Brandenburg Gate). But in re-framing the evidence the UK can be considered as equally defeated; the bullet holes in the walls at Amritsar are a more fitting testimony and potentially more valuable to the national character than any tribute to the glorious dead defending the empire. 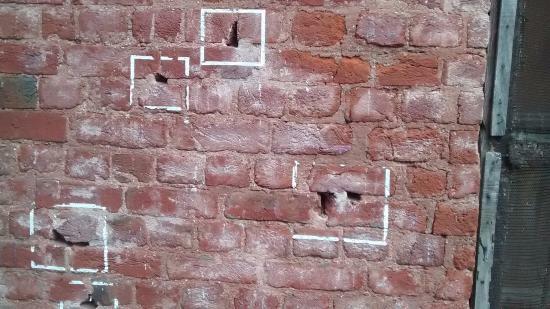 Bullet Holes in the walls at Jallianwala Bagh, Amritsar, Punjab. Image subject to © . The most successful memorial as visitor centre and museum I have seen is Oradour-sur-Glane, a village in France and the site of destruction and massacre of the population by the German army. On the instructions of Charles de Gaule it was sealed off to preserve the evidence of the atrocity as it had occurred. On arrival one is directed through an underground tunnel from the modern world into the heart of the deserted original village. 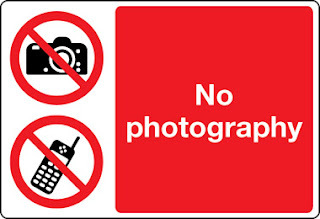 Crucially the visitor is instructed on appropriate behavior including, no dogs, no photography or filming and no food or drink. With less distraction the silence encourages a presence to the terrors and increases the chance of empathy. A white tourist's lack of empathy epitomised by the ubiquitous selfie at a memorial to black suffering directly as a consequence of white oppression is perceived as disrespectful in William.C. Anderson's article. 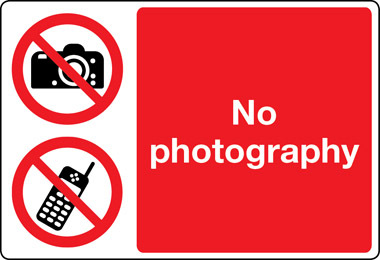 The selfie defined arguably as only casual narcissism and photography's diminished power and importance by the vast numbers of digital images created can be argued as devaluing of any subject. In the context of the US civil rights movement, the contemporary snaps at a memorial to the subjugation and murder by a previous generation who thought so little of the victims that they photographed them as entertainment and were produced as postcards is darkly ironic. Mr Anderson's perfectly erudite description of the act as the ‘rigorous documentation of their own evil’ might be equivalent to the US army selfies with torture victims at Abu Graib. As part of my photographic project 'Lynching in America' I have included some abstracts of the soils in the jars as a typology to emphasise the scale and geography but my main focus is in the documentation of the simple, intimate action by the direct descendants Frances and Walter of the murdered boy Austin Callaway. This documentation of the collection of soil at the site of his lynching whilst conventional in appearance is not intended as a conventional editorial, photojournalistic observation. Entering the unmarked woodland glade and recording the events at the site of the lynching of Austin Callaway with his descendants Frances and Walter, my actions as a white photographer could be compared to a continuation of the damaging legacy of recording mass murder as entertainment and in this re-enactment I am a valid participant in the action equal to the subjects in a process of reconciliation. Any act of reconciliation requires the presence of all parties and I am welcome and present behind the camera. This event whilst staged for the camera is a collaboration and a genuine act and is not just between myself Frances and Walter but the result of negotiations with a huge number of other invested people from the La Grange community, black and white, church, police and state. Understanding of photography is transformed from a conventional document of complicity to murder and oppression, to its antithesis. It is the catalyst for healing and a search for truth. As the subject, the experience of being seen and recorded can feel personally valuable and in this moment Frances and Walter's lives are recognised as valuable to this process, very different to how the mob must have viewed Austin Callaway in 1940. At the time of documenting our quiet act of truth and reconciliation, the riots of Charlottesville were in full swing and drawing the media gaze with the burning torches and chants of "Blood and Soil". *The apology was not for the lynching but for the failure to protect Callaway from being taken from the police station cell by 6 white men and murdered in nearby woods. One indication perhaps of inherent racial bias and 'white saviours syndrome' is that the much-respected white Police chief who offered the original apology became the centre of the media story eclipsing the black community’s courage in its willingness to accept the apology and the hard work of the Equal Justice Initiative led by Bryon Stevenson for inspiring the entire process. **There is the matter of the colonial gaze as an accidental inherent bias of the white documentary photographer as an ‘invested observer’ and obstruction to the fair and objective representation of any event . There is a responsibility on a contemporary photographer seeking documentary truth to at least have an awareness of this legacy..